First there was blooming tea: a specially tied bundle of tea leaves and flower petals that opens into a flower when placed in hot water. Now, there’s the blooming marshmallow, from innovative pastry chef Dominique Ansel. 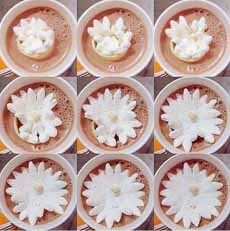 Blossoming Hot Chocolate—more accurately, blossoming marshmallow—is a thin marshmallow, cut like a flower, and bunched up to resemble a closed flower bud. Some dabs of white chocolate keep the bud closed. When placed in a cup of hot chocolate, the chocolate melts and the bud expands into the flower. Check out the videos from Ansel, then the fan recipes (we like the poinsettia the best), in the videos below. Make plain versions (all white or tinted pink marshmallow) before you try more elaborate colorations. TIP: Ansel added a small chocolate truffle to the center of the flower. The flower itself is anchored in chocolate. We think that’s a lot of chocolate! Instead, we’d use a small pecan cookie ball (a pecan sandy), a ball of cookie dough, a piece of caramel hand-rolled into a ball, or a small hard candy ball (as in the photo at right). Drop the “bud” into hot chocolate and watch the “flower” open (photo courtesy Dominique Ansel).